Today we're talking to Nancy Halvorsen, creator of the oh-so-fun collection, Ho-Ho-Ho, Let It Snow. 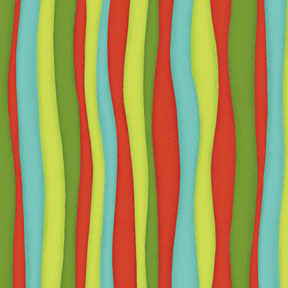 The line includes a panel (approximately 24" x 42") and a wide variety of coordinates, shown below. What was the starting point for Ho-Ho-Ho, Let It Snow? For quite a while I had been thinking about doing a line that was exclusively snowmen. Because who doesn't love snowmen? I wanted to have it be something that could continue on through the winter after Christmas too. To me, it always seems so bare when you put all the Christmas decorations away. 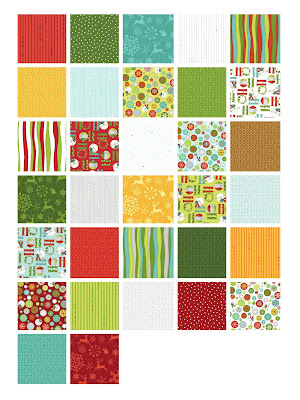 Do you have a favorite print in this collection? It would be hard to pick just one, but the print looking down at a snowman from the top is probably one of the more fun ones. I wanted to think of what I could do with a snowman that I hadn't seen before. 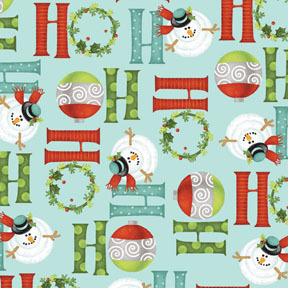 When I put the words ''Ho Ho Ho'' on the panel, I was trying to think of something round for the ''O'' and realized that a snowman is round from above; it works for the shape. It was fun to come up with the idea of looking at a snowman from a different perspective. I usually try to find some new way to look at the things I'm doing—some new take. 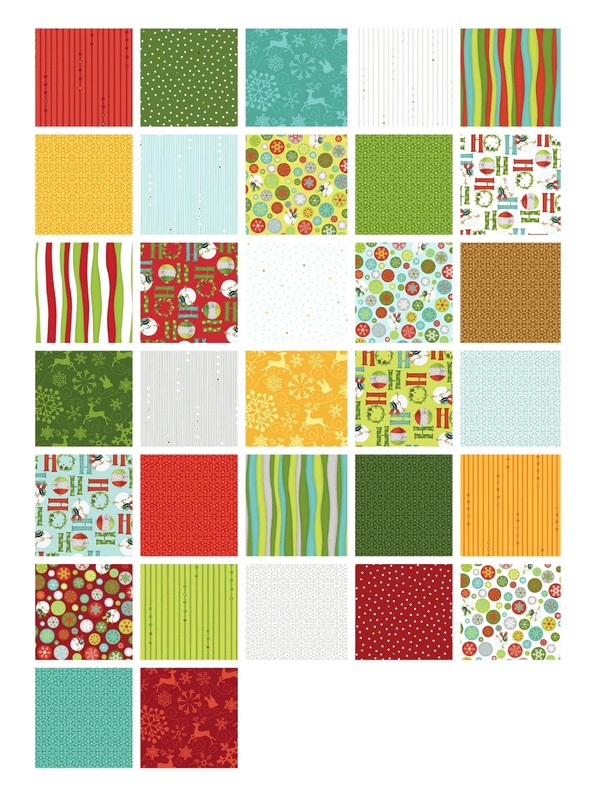 Is it challenging to create a new and different holiday line each year? I do try to change it up a little bit but at the same time stay true to my look. I like to maybe mix some new colors in and things like that. I feel like it refreshes me to put something new in that I haven't used before. I do the same thing with my Christmas decorations—take out something that I'm tired of and put something new in. What is your actual design process? I start sketching out on paper. Then I will scan my drawings into the computer and draw over what I've sketched. It's much easier to lay things out and size them on the computer—easy to move around. Drawing with the mouse is like drawing with a brick. Who do you have in mind when you design? I end up designing things that I want in my house. 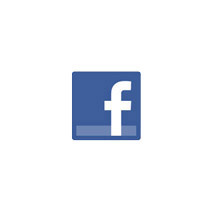 I think, ''Oh it would be fun to have a _____" and so far it's turned out to please everyone else as well! Tell us about the stripe. A lot of my designs in the past have been wavy lines instead of straight. 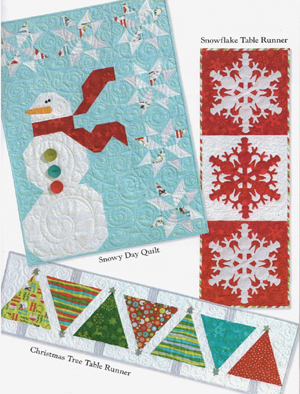 I thought it would be fun to do a thick and thin wavy line to look like a decorated tree, or to put on the snowman's scarf—and it would be a great binding for a quilt too. 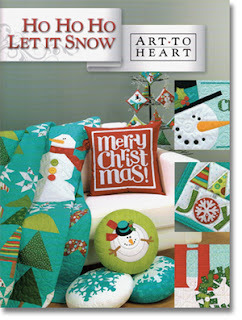 What's your favorite project in the coordinating Ho-Ho-Ho, Let It Snow pattern book you published? I do love my round snowman pillow with the view of the snowman from above. 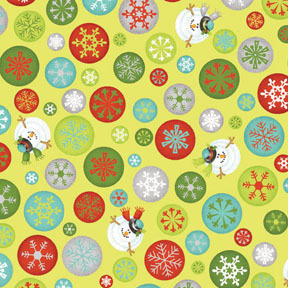 I also like the snowflake made out of snowmen—a little surprise—you often don't notice the snowman in the flake right away. I've been designing patterns for 21 years. I started when my youngest daughter was 3. I have 4 children, all married now, and 8 grandchildren. It's been something that they've grown up with and I've grown up with. I have four very creative children. Three of them are in the graphic design/art/creation business and the other one composes music and is a sound engineer. They're all very creative. I'm by far not the most talented in my family—my children are far more talented than I am. Why did you decide to name your company Art to Heart? Always had a love for art. Before I started my company, I did tole painting, stained glass and cross stitch. I do truly have a tender spot in my heart for all things creative and artistic. Learn more about Nancy and her work here. 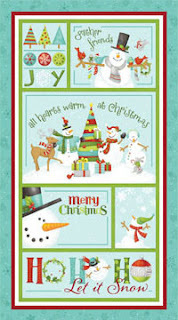 See the entire Ho-Ho-Ho, Let It Snow collection here. Great collection! I love hearing about the designs and the designer. Thanks! I have a few of Nancy's books. She's pretty talented! Beautiful fabric collection. I always love Nancy's fabrics and books. where to buy the fabric? any suggestions of an online place?